Tapestry of Grace is a curriculum that I'd heard briefly about but had never taken the time to look in-depth at what it completely entailed. As part of the Homeschool Crew, I was sent the third digital unit Year Two: Of Crowns and Colonies (Colonial America) from Tapestry of Grace's new digital edition format. 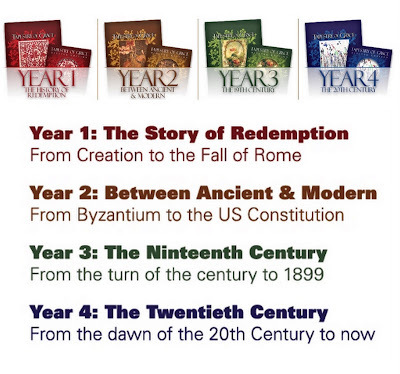 Tapestry of Grace (TOG) is a classical-style homeschool curriculum from Lampstand Press that uses a unit study approach to look at history chronologically. The curriculum uses a four year rotational study and is designed for use from Kindergarten through High School (meaning you can use it through your entire time homeschooling your children). The history study begins at Creation and ends present day. This is a curriculum that you can use with all of your children simultaneously - each studying the same part of history together, but at their own learning level. Tapestry of Grace covers the following subjects in depth: history, church history, literature, geography, government, philosophy, and writing & composition. It does not include a phonics program, science, math, grammar, spelling, or foreign language. The TOG curriculum itself is primarily a guide for the teacher that includes extensive notes. It does provide complete lesson plans from K-12, but requires additional resources (mainly books) to use the curriculum. Some of the books might be found at your local library, or you can purchase them through TOG or elsewhere. It is not a curriculum that you will purchase and be able to use the day after your purchase/receive it. It will require additional planning on your part to have other resources on hand to go along with the curriculum. To give you an overall idea of how extensive a Tapestry of Grace unit is, the Of Crowns and Colonies I received (an 8 week study) is 528 pages. At the start of each unit there is a summary that introduces the unit and gives special notes and 'heads-up' for that particular unit. Each unit is then broken up into weekly segments that list activities by subject and also by the level that they are targeted to. The format is very user friendly (although a bit overwhelming at first) and includes check-boxes to mark off what you would like to complete or have completed. Teaching objectives are given for each week along with extensive notes and helps for the teacher. Suggested assignments are also provided, along with long-term unit projects, printable student worksheets, so much more. The DE (digital edition) of TOG uses a program called LockLizard and is stored on your home computer. The program searches for updates that are made to TOG and keeps everything up to date for you - so you don't have to! You are able to print off your lesson plans as many times as you like. It is available for immediate download so you don't have to pay shipping charges or wait for it to arrive in the mail - instant gratification! It also comes with a lower price than the print edition. You can purchase individual digital units for $45 each or the whole year of 4 units for $170. A print version is also available for $225, or a print/DE combo package for $270. ~ 'Layered Learning'. Cycling through the levels every four years is such a great concept! The children will understand so much more each time they return to study the different periods of time. Knowing it is a four year cycle also helps with the "I need to do it all NOW!" mentality - you can relax and know you will be returning to it again later and can learn more then. ~ Digital vs. Print. Overall, the curriculum itself is extremely impressive. I personally have a harder time with digital products because I am a hands-on girl ~ especially when it is a product of this magnitude. The unit I reviewed was over 500 pages, and having to pick/choose what to print was hard enough. In my case I would invest the extra money for the print edition so that I had it on hand and didn't have to put my printer into serious overdrive. The other option would be purchasing the combined version of print and digital to make copying/printing student worksheets easier. ~ Four Years = Entire Schooling. I love the concept and plan that Tapestry offers. While the price of the curriculum might seem overwhelming at first (each year digital is $170 or print is $200-225), you only have to buy four years of curriculum. The number of children you have doesn't matter, because you will use it for your entire time homeschooling. ~ Variety of activities. Tapestry offers suggestions for crafts, discussions, plays, and so many other activities to go along with the lessons so that you can fit something to how your child learns. ~ Resources. I had a difficult time finding the bulk of the books that were recommended to go along with the unit I received. My library did not have many of the books available. There is flexibility in the guide to use other books in place of the recommended resources, but it did require additional planning time for me to search/find books that would work in place of the ones mentioned. The other option is purchasing the books directly from TOG or elsewhere online ~ a lot would depend on how much extra money you had to use toward homeschool curriculum. ~ Lapbooks. I love lapbooks. In fact, I'm pretty much a sucker for them. Tapestry also offers lapbooks to go along with each unit they offer. They are geared toward lower-level students, but are a great addition to give a more 'hands-on' learning touch. Individual unit lapbook kits are available for $15 or you can purchase a complete year set for $55. 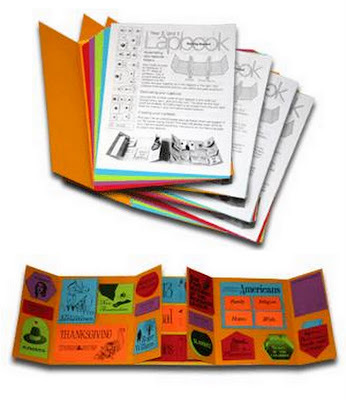 Each kit comes with full instructions on how to assemble the lapbooks. The lapbook for the unit I received contains 25 pages filled with minit books that correspond to the unit on Colonial Times. "When you buy Tapestry of Grace DE, you are not buying a copy of the curriculum. You are buying software which grants you the permanent right to use (and print) copies of the curriculum for your family's personal use. LockLizard is controlled by a computer-specific license that you purchase. Thus, DE products are non-resalable and non-returnable, so it's important for you to read the EULA and play with our Samples before you buy. For no additional charge, network licenses are also available should you desire to have Tapestry DE running on several computers in your home." The index page for Tapestry of Grace provides numerous downloads for you to get a more in-depth look at TOG including 3-week sample downloads, brochures, as well as an introductory packet with sample cds and brochures if you need a more 'hands-on' view of the curriculum. In addition, Tapestry has a wealth of resources available through their site: forums/community, a store with coordinating resources for Tapestry, and so much more. about other units from Tapestry of Grace. I meant to say Hi, Jolanthe, not I Jolanthe..oops. Jolanthe, I have to admit, I have only skim read your review and then went to the TOG site...but I was wondering...how are you finding it? My kids are all under 5 but they are gifted, so I like that it is for stages, not ages...it IS a lot of money though, and I am concerned about the no resale issue...what if it's not a good fit for us? We're out of pocket AND stuck with resources that we can't use? What do you think? I Googled "TOG lapbooks" for a picture this morning (cuz I'm too lazy to take one of my own!) and your site came up first thing! So fun! Anyway, if its OK, I am going to use your lapbook picture above....but I'll be sure to give you credit. Great review by the way. THat's A LOT of curriculum to go through.